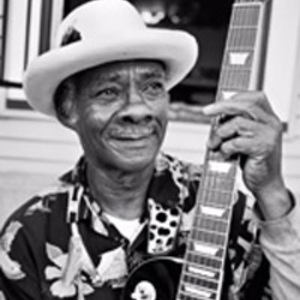 Bluesmen like LITTLE FREDDIE KING are unfortunately, a disappearing breed, making his music so important, both as a good-time blast of backstreet grit and as a document of an artist who is among the last of his kind. Son of a Mississippi share chopper, Freddie jumped a train for New Orleans at the age of 14-years old, never looking back. Born in McComb, Mississippi (1940) Freddie is the last of the great delta style country guitar players. In the 50s he was busy playing and learning from Babe Stovall, Polka Dot Slim and his friend Slim Harpo. Son of a Mississippi share chopper, Freddie jumped a train for New Orleans at the age of 14-years old, never looking back. Born in McComb, Mississippi (1940) Freddie is the last of the great delta style country guitar players. In the 50s he was busy playing and learning from Babe Stovall, Polka Dot Slim and his friend Slim Harpo. Little Freddie is a feature artist at the French Quarter Festival and New Orleans Jazz & Heritage Festival each year, besides bringing his whiskey soaked Juke Joint style to Europe, once in awhile. Listen to his music, kick back a beer and enjoy American roots blues.